Thanks to the groundhog, it’s official – we have six more weeks of winter. But that doesn’t mean we can’t start thinking warm and tropical thoughts! 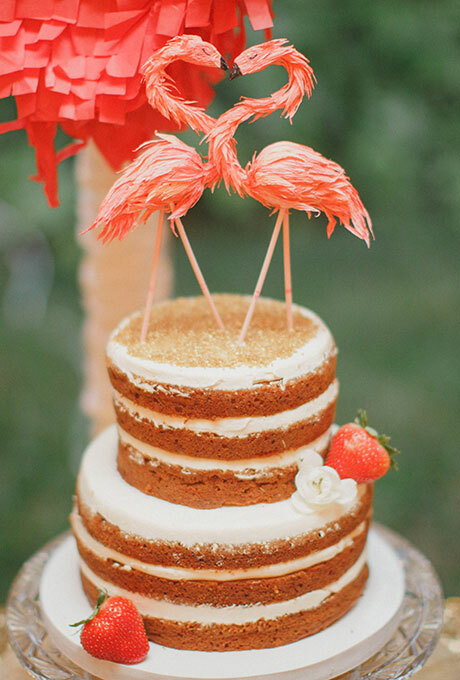 I’ve had enough snow and cold weather to last until next winter so today I decided to find something fun and warm and beach-y to share – and I found this adorable pink flamingo cake topper! And while the cake topper looks amazing on the “naked” cake featured here, it would also work on a frosted cake. Plus, they’re super cute and would be ideal for your summer wedding – even it is isn’t on the beach. I just love the warm weather vibe from the flamingos. They bright pink flamingos also look like they’re kissing and their heads form a heart. It’s really a win-win when it comes to this cake topper! You can find the kissing flamingos here.